A (sacred) hour in the company of Magnum is rarely time wasted, although the past couple of albums – 2016’s ‘Sacred Blood “Divine” Lies’ and last year’s ‘The Valley Of Tears’ ballads collection – have been disappointing, treading water rather than making waves. 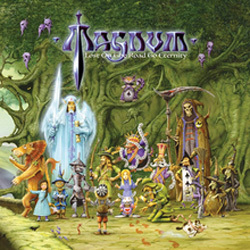 Any release from Magnum should be magical rather than mediocre, and with ‘Lost On The Road To Eternity’ the band have clearly relocated their mojo, greeting 2018 with one of their most exciting and accomplished outings in forty-plus years of making music. Serving up the customary mix of pop-infused shorter songs and less commercial pseudo-epics, and infused with some of Tony Clarkin’s most majestic compositions to date, ‘Lost On The Road To Eternity’ boasts more swagger than its predecessors, as if imbued with a greater confidence and self-belief. The band’s twentieth studio album also introduces a new-look band with keyboard player Rick Benton and drummer Lee Morris alongside bassist Al Barrow and founder members Bob Catley and the aforementioned Clarkin. In addition, Edguy /Avantasia’s Tobias Sammet puts in an appearance, duetting with Catley on the album’s grandiose title track – a bit of a role-reversal for a guy who usually has the likes of Catley singing on his own rock operas. There’s not a duff track on offer and it’s impossible to resist the allure of ‘Welcome To The Cosmic Cabaret’ with its Seventies’ prog rock instrumental middle section, the foot-stompin’ ‘Without Love’ or the singalong ‘Ya Wanna Be Someone’. As you’d expect, the playing and Catley’s vocals are flawless throughout, and this time around the keyboards have been given a more prominent role in the mix, coming to the fore more than on previous albums and adding to the lustre. Complicated but accessible, commercial but densely layered, it’s an album of overt possibilities, a wolf in Rodney Matthews’ clothing. Enjoy.